I've read other's experiences with annoying bikram neighbors but today was my first day with an issue. 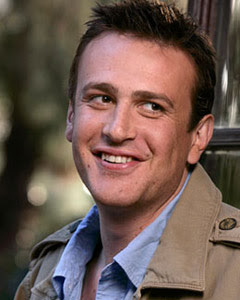 The guy next to me was TALL - over 6 feet tall and kind of looked like Marshall from How I Met Your Mother. He lacked grace and as soon as we moved into Tree Pose oafishness happened. He was wobbling, then JUMPING so much that he bounced off his mat and dangerously close to mine! I'm not a "personal space is sacred" bikrammer and have no issues with ocassionally bumping into a neighbor during full locust but when a big guy has obviously lost control of his pose and is jumping towards me - well my concentration is shot. Luckily after that he settled down and skipped most of the standing series. The instructor today was new too - very nice but didn't deviate from the dialogue to correct him or tell him to relax and focus on one part instead of trying to complete. Like Amy says, "You have your entire lifetime to complete the pose, so just focus on what your body can do today." In more positive news I was able to hold most of the standing poses for much longer today. I think my legs may finally be strengthening!